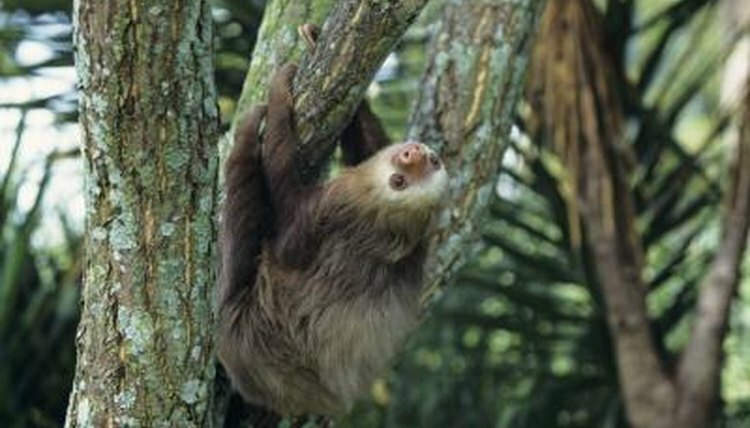 They live in forests throughout Central and South America, but you'd never know they're there -- sloths are extremely sedentary animals that spend their days lounging in treetops. Six sloth species are alive today. Of those six, one species is considered endangered. The pygmy three-toed sloth (Bradypus pygmaeus) is the smallest and most endangered sloth species. These sloths can exist naturally only on Isla Escudo de Veraguas, a small island off the coast of Panama. Pygmy sloths reach 1 1/2 feet to 3 feet long and weigh between 5 and 8 pounds, making them somewhat smaller than other sloth species. The maned three-toed sloth (Bradypus torquatus) is the second-rarest sloth species. These animals live only in Brazil and are considered a vulnerable species by the IUCN Red List of Endangered Species. They're defined by the long black hair that runs from the back of their necks over their shoulders, which can grow as long as 15 inches. They're about 1 1/2 to 2 feet long and weigh 8 to 10 pounds. Bradypus tridactylus is distinct from other sloths because it has no tail or external ears. They are of average size for sloth species, 1 1/2 to 2 1/2 feet long and weighing between 5 and 12 pounds. They live in rainforests from southern Central America to northeastern Argentina. They are considered abundant in their native lands. Bradypus variegatus, aka the brown-throated sloth, is native to southern Central America and South America, and the countries of Bolivia, Brazil, Columbia, Ecuador, Honduras, Nicaragua, Panama, Paraguay, Peru, and Venezuela. They once lived in Argentina, but their populations are now considered extinct in that country. The brown-throated sloth is classified as of "least concern" by the IUCN Red List. The southern two-toed sloth is also called Linnaeus' sloth after the species' discoverer (Choloepus didactylus). These animals are covered in brown fur except for their black faces. They reach lengths of about 2 to 2 1/2 feet and weigh roughly 9 to 18 pounds. They hide almost motionless in the treetops of Central America and northern South America, including portions of Brazil and Peru. Their tendency toward lethargy keeps them safe from predators. Choloepus hoffmanni is a hardy sloth species that lives in a wide variety of habitats in Central and South America. Two distinct populations have developed, one in the north -- in Colombia, western Ecuador and westernmost Venezuela -- and another in the south encompassing the area east of the Andes in Ecuador, Peru, Bolivia and western Brazil. Hoffmann's sloth is about 2 feet long and weighs around 12 pounds. This species has a distinct pale face and a protruding nose that resembles a pig's snout.